Over more than twenty years, Cimbal Classic, a versatile band from Brno, has become one of the most original bands on the Czech music scene. As an ensemble they first appeared in 1992 at the "Okolo Třeboně" folk festival. The group of musicians – schoolmates from the music school – the conservatory – performed not only interpretations of Renaissance and Baroque music, but also non-traditional arrangements of folk songs. The first impulse, which evolved into a number of performances, was a joint performance with a star of Czech folk heaven, Vlasta Redl. Thanks to its originality, musical universality and high level of professionalism, the ensemble has become a welcome guest at most prestigious folk events in the Czech Republic, as well as in Austria, Belgium, Germany and Slovakia. Their cooperation with other famous Czech musicians or bands is the basis for some of the later recordings. Since the second half of 90's, the band has been going their own way and their own concerts especially feature the original song-writing of its band leader and dulcimer player, Dalibor Štrunc. Thanks to his writing and the singing of his wife, Kateřina, the ensemble is original and unique. In addition to hundreds of concerts at home or abroad, in almost twenty years of its existence, Cimbal Classic has recorded ten independent, thematically diverse CDs and has been involved in another seven albums. They include innovative original songs, orchestral compositions, but also sensitive arrangements of folk songs, especially for Christmas and Easter. The concerts and recitals have been recorded and broadcast not just by Czech Television and Czech Radio, but also by the BBC. All of that seems to be an admirable achievement, when we realize that the members had played or still do play in other ensembles. 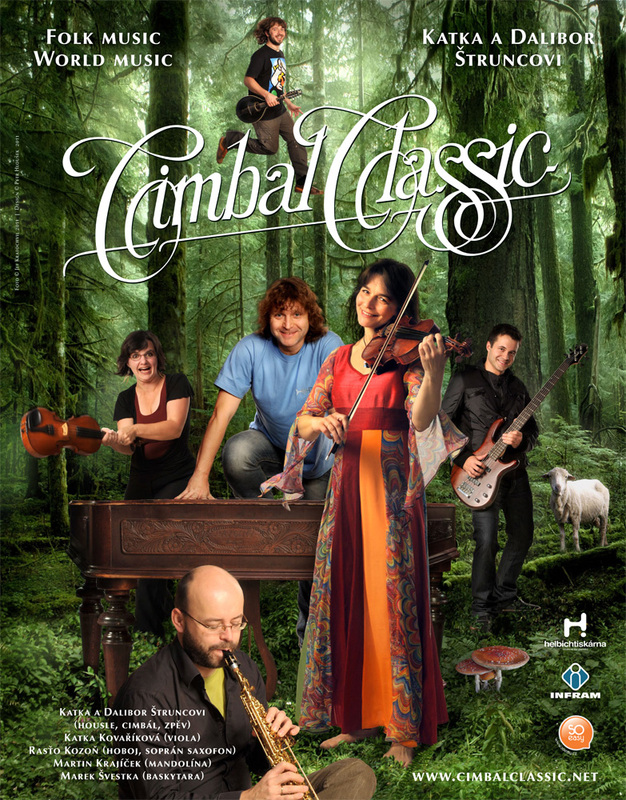 Cimbal Classic today – a timeless music group influenced by folk music, but also classical music floating somewhere on the border of these minority genres, and the CD “Melodies From Around the Globe“ is another interesting trip derived from these influences.